Col. Phil Conran (USAF, ret.) 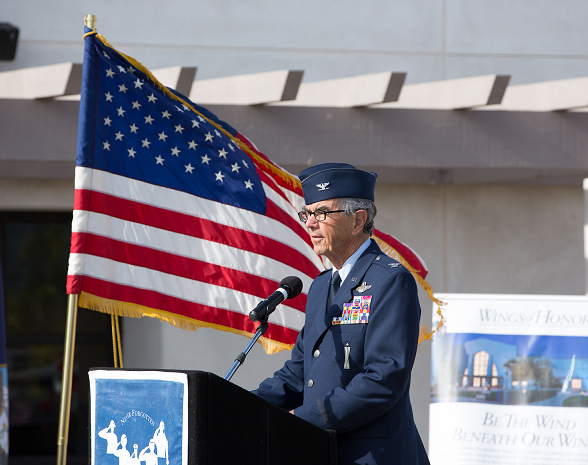 recounts derails of the Pearl Harbor attacks to an audience of 150 at the Santa Barbara Airport on Dec 7. Photo by Kenji Fukudome. Santa Barbara, Calif., Feb. 7, 2017— Col. Phil Conran (USAF, ret) is one of three new inductees into the Fordham University Military and New York City ROTC Hall of Fame. Inductees are honored based on their contributions through active or reserve components of the armed forces; by being highly decorated for wartime actions; or for exceptional achievement in the civilian life by a veteran or ROTC alumnus. After graduating from the Fordham University Air Force ROTC program in 1958, Col. Conran served for thirty years in the Air Force. During that period, he served in Nevada, Michigan, Bermuda, and Los Angeles prior to being assigned to the 21st Special Operations Squadron where he flew combat missions in North and South Vietnam, the demilitarized zone (DMZ), and Laos. He was awarded the Air Force Cross, our nation’s second-highest award for valor. In addition, he received the Airman’s Medal for saving the life an injured crew member. Prior to his retirement in 1988, he was the Commander – European Office of Aerospace R & D in London, England. His other decorations include the Legion of Merit, Distinguished Flying Cross, Purple Heart, Meritorious Service Medal, Air Medal and Air Force Commendation Medal. He retired with the rank of colonel in 1988. In 2000, Conran moved to Santa Barbara with his wife of 57 years, Margaret (Tierney) Conran. He currently serves as Board Chair of the Pierre Claeyssens Veterans Foundation. Additionally, Conran has been a member of the Legion of Valor since 1970 and retired at the end of 2016 from the position of National Adjutant after 16 years serving in that role.